For those of us that live in unpleasant Winter climates, this time of year does not involve a lot of grilling. However, that lack of grilling does not have to mean an end to making your own roasted red peppers. 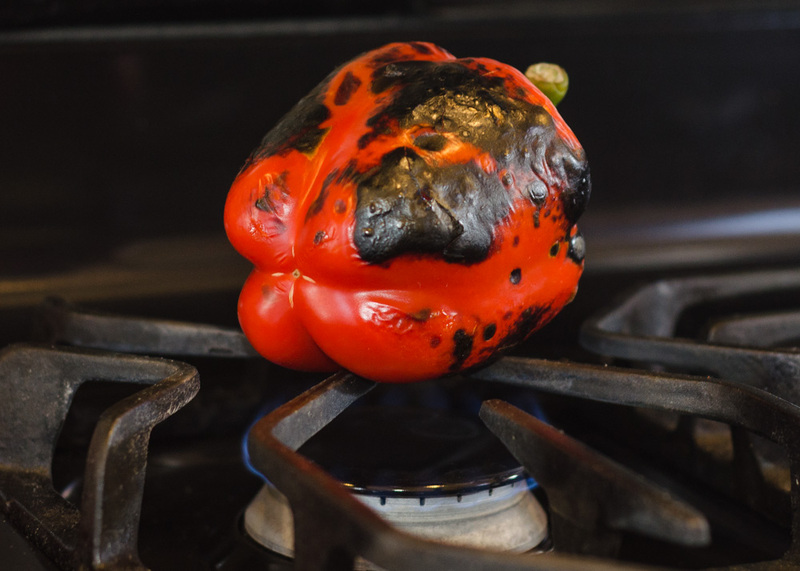 If you have a gas range, you can actually roast red peppers indoors right on your stove. Keep in mind that this is not a solution for making roasted peppers at scale. You’ll probably only do 1 or 2 at a time this way due to space constraints. It still takes about the same amount of time (a good 45-60 minutes all-in) as the grill…maybe a bit longer because you’re not benefiting from the indirect heat of the grill. But hey, you get all the goodness of a roasted red pepper in the middle of winter. Could you just buy that jar of oil-packed peppers on the shelf at the Jewel? Sure. But that’s not nearly as fun as doing it yourself. It’s a fun process to watch – and you get a front row seat to see it all. So I guess you really have to enjoy the whole process of the bell pepper transforming from a sturdy, crunchy, standalone and dip-worthy vegetable to one that will present a whole new flavor and now a have starring role within some other dish. Place the red pepper directly over a flame to somewhere between medium to medium-low. It should take about 5 minutes per side to give it a good solid char. You’ll want to blacken and blister about 80% of the surface. The only thing I would do differently if using a grill is rub the exterior in oil to help raise the surface temperature. Doing this indoors over a gas flame is obviously a horrible idea. Now there’s a lot taking place here. Not only are you cooking the surface of the pepper, but you’re cooking it internally as well. The average red pepper is about 82% water by volume, and that water is turning into steam over the roughly 20 minute cooking window. As that steam is sealed inside the pepper, we’re cooking it two ways here. 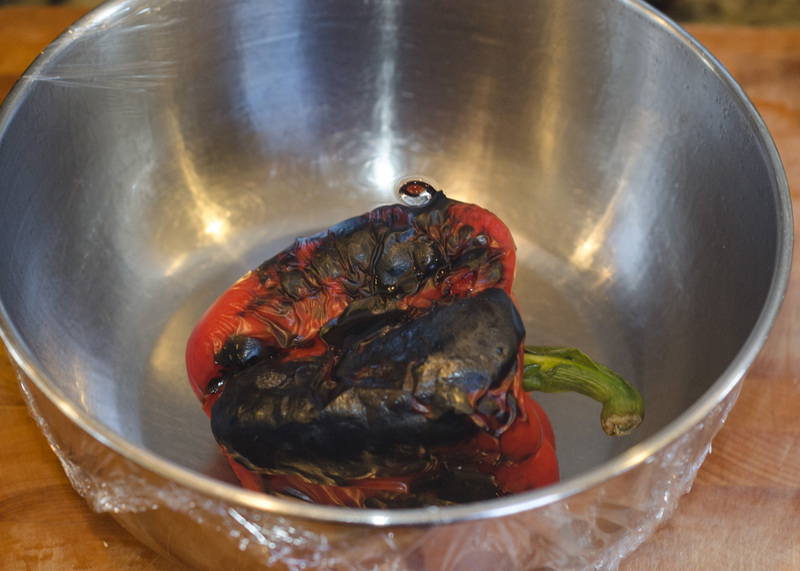 So after the pepper is well charred and you take it off of the stove, place it in a bowl and cover it tightly with clear plastic wrap. We’re putting that steam to more good use here as it slowly escapes from the softened pepper. That steam is 1) going to continue cooking the pepper while it rests and 2) going to really burn your hands if you rush the process. As the steam escapes in the tightly covered bowl, it also will help to loosen the charred skin. After about 15 minutes, the pepper should be cooled thoroughly and you can place it under running water to gently rub off the exterior skin. It should now look like the pepper in the Lower Left quadrant of the picture above. Next, poke your finger into the top and pull out the stem. It should come out easily. If you tear down one side, you can open up the pepper to rinse out all of the internal seeds and white ribs. The ribs are still mildly bitter, so I like to pull them out. The pepper should now look like the Lower Right quadrant when you lay it out on a cutting board. It’s up to you from here….let me know if you found some great uses for it! Good call on the broiler, Elaina, could probably do 3 or 4 at a time that way. I'll have to give that a try next time….